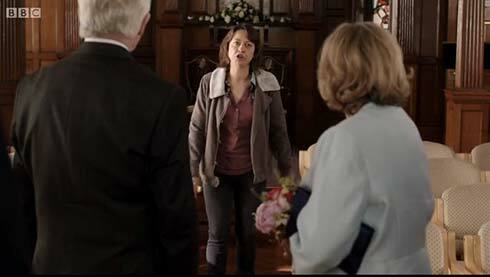 At the registry office, Celia (Anne Reid) sits in a very pretty suit clutching a bouquet as episode 2 of Last Tango in Halifax begins. We’re mere minutes from the end of episode 1 when Gillian ran out the farmhouse door after finding the card from the Registry Office. A man in an apron sits beside Celia, asking how long it will take. 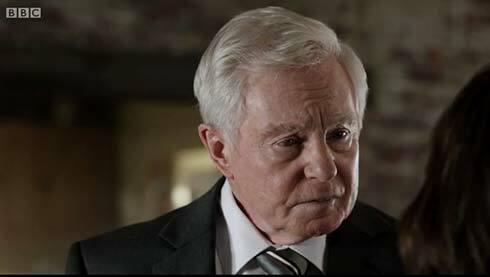 Alan (Derek Jacobi) drags in a policeman. He lassoed them to be witnesses to the wedding, but has to promise them both a £20 note to get them to stay. Celia looks like she has many misgivings about these two being at her wedding instead of her family but Alan breezes along as if he doesn’t see it. Gillian (Nicola Walker) slams the Land Rover into a parking spot and runs into the Registry Office. Gillian’s upset, angry, hurt, defensive. She berates everyone, angrily blaming her father’s behavior on Celia. She walks out, comes back to yell some more, and leaves again. Celia says she’s a bit shaken. She wants to ring Caroline. Alan says they should ignore Gillian. Celia said getting married in secret was supposed to be a bit of fun. Alan insists they shouldn’t let it make any difference. Gillian, outside in her car, is falling to pieces. 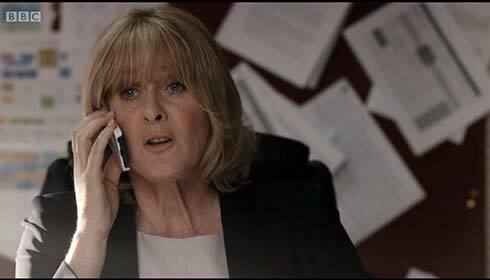 Caroline (Sarah Lancashire) phones, but Gillian lets it go to voice mail. 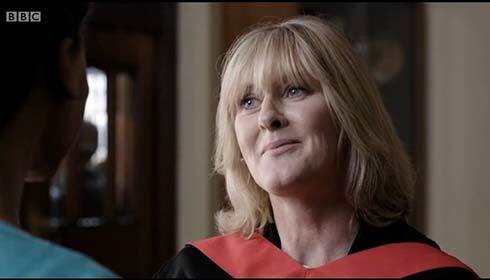 Instead, Gillian calls Robbie (Dean Andrews) and wants to meet him during his lunch time. 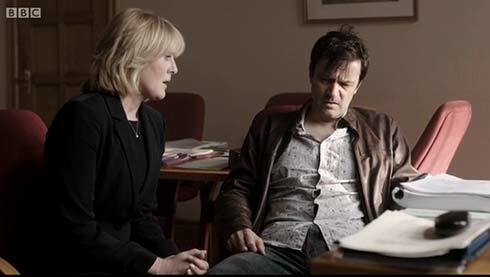 John (Tony Gardner), at Judith’s (Ronni Ancona), calls Caroline (Sarah Lancashire) and says he wants to talk to her soon. Caroline tells him to come to her office at 1:30. Robbie and Gillian meet in a pub. It’s so nice that she has someone to call now. I remember an earlier scene where Gillian really needed someone to talk with and there was no one there for her. Robbie is. Robbie tells Gillian he thinks she’s overreacting. He tells her she can’t be jealous. She responds, “I’m not jealous.” Then she goes on to make all sorts of jealous remarks about how posh Caroline is. She talks about how much she and Alan have been at odds the last two weeks. When Robbie asks what they’re at odds about, she won’t explain. Finally Robbie says, “Should we get married and not tell anyone?” This elicits a big smile from Gillian. The scene ends so we don’t know if it was a serious proposal or if Gillian gave a serious answer. In Caroline’s office, John is telling Caroline that he wants everything to go back like it was. He’s disheveled and rumpled and looks pathetic. “My publisher’s dropped me.” John says. She offers him tea in an act of kindness or perhaps pity. Gillian says she thought it was because of what he said to her when he learned she’d slept with John. 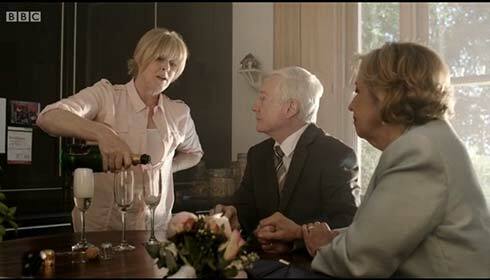 Alan and Celia try to explain their behavior, but Gillian continues to fuss. Alan says, “We’re married now. We expected our surprise to make everyone happy. Not this.” Gillian apologizes again for overreacting. When they drive off, Gillian mimes shooting herself in the head, and walks back to the house pulling her hair. Two cars pull in to Caroline’s house. 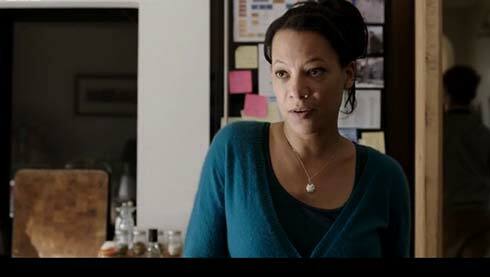 Caroline and Lawrence (Louis Greatorex) are in Caroline’s SUV, Kate (Nina Sosanya) drives up in a smaller, sportier car. Caroline gets out and greets Kate with, “Have a good day?” This must be their routine now that Kate’s moved in. Meanwhile, Lawrence continues to sit in the car and look daggers at Kate. Kate levels a stare at her, “You ARE going to find time to get divorced.” In return, Caroline gives Kate a beautiful, loving smile. We have to read a lot into that smile. We see Alan and Celia talking, laughing, holding hands, snuggling – we see Gillian and Robbie working together at the farm, talking, supporting each other – but we haven’t seen much interaction between Caroline and Kate. I think that one smile is pulling a heavy load. Lawrence said he heard John was at school today looking hung over. Kate wants to know what they talked about. Caroline says she’ll tell her later. Raff and Ellie are at the farm, having tea with Gillian and Robbie. Gillian curses Caroline, Celia and everything that has anything to do with Harrogate and her dad leaving the farm. Inside, Caroline pours champagne and offers congratulations. She tells them Kate has gone home to her own place for the night while they sort out a few things. She said William has a job in town and Lawrence is upstairs sulking. He got in trouble for his remarks to Kate. Alan explains that it’s nonsense to think that their decision had anything to do with Kate. Caroline tells them about John losing his publisher, which means he can’t afford to buy her out. She wants to buy John out. She says she’s getting the house evaluated, but she thinks it’s worth about £850,000. She asks her mother for £100,000. Plus, she plans to ask Kate to sell her house to contribute, too. Suddenly she realizes she’s talking to them about money on their wedding day and sends them off with the bottle of champagne. Celia stays behind a moment. She tells Caroline that the hurried secret wedding was actually because of the consultant’s warning in the hospital that Alan probably wouldn’t survive another heart attack. Alan likes to pretend they just did it for a bit of fun, but that they really just wanted to get it done. The continuity in this scene drove me crazy. The level of champagne in the glasses changed every time the camera angle changed. Next morning, Gillian calls Alan and tells him Raff wants to leave school. When Alan wants to know why, she says, “There’s a girl involved. It’s a man thing.” Celia says she’ll drive Alan over to Halifax. Caroline and Kate are deep in conversation as they walk to assembly. Caroline asked Kate to sell her house. Kate says it’s so early in their relationship. She’s concerned about how settled they are and Caroline says, “I want to spend the rest of my life with you.” The audience hasn’t seen the degree of depth developed between these two that would make us believe Caroline is ready to make that powerful a statement, but Kate is moved by it. They are in the hall behind a huge room full singing students. Kate grins, “I can’t kiss you here.” Caroline smiles, too, and says, “You really can’t.” They look as if they might, anyway. Caroline says things are just moving faster than expected because of her need to buy out John. Kate promises to get her house evaluated. Then she says, “I would have brought it up later, when things were more settled, but I want you to know I want to have a baby.” Caroline looks stunned, then laughs. Kate says, “I’m serious,” just as the singing ends and Caroline has to turn to walk down the aisle for assembly. 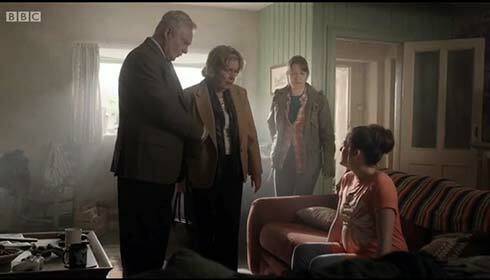 At the farm, Gillian tells Celia and Alan that Ellie is inside and pregnant. Gillian is taking her to the doctor in a few minutes. Raff is convinced it’s his. Inside, Ellie is having contractions. Guess the 8 months number was a little off. Alan, who needs zero excitement about now, says he’ll get her to hospital and Gillian should go get Raff. Celia calls Caroline to tell her she’s delivering babies. The question is whether it’s really Raff’s. Celia tells Caroline not to worry about money. She asks if Caroline’s talked to Kate. 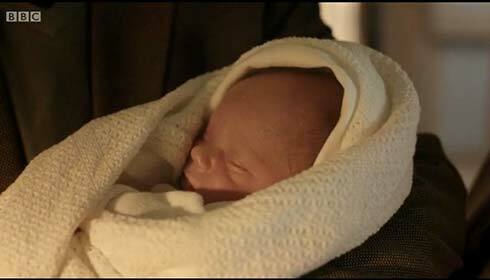 Caroline says yes, but she hesitates to explain about Kate wanting a baby. It’s hard to tell just yet what difference, if any, that’s going to make. Celia says, why don’t you just sell the house? Caroline says, “I can’t sell that house.” She’s mentioned before how attached she is to that particular house. Will she let it ruin her relationships with everyone to keep it? In Ellie’s hospital room, she’s clutching Alan’s arm during her contractions and talking about how she doesn’t want a baby. He tries to be reassuring. She tries to pretend she’s not even there. Raff arrives. The midwife says it will still be a few hours. Gillian wants to know if Ellie’s rung her mom and says she will if Ellie hasn’t. 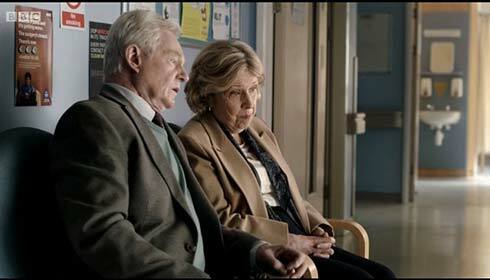 Alan and Celia snack on junk food in the hall, talking about how Celia almost died giving birth to Caroline. They discuss the fact that Raff and Ellie are the same age they were when they fell in love. Celia says, “We never would have carried on like that.” Alan says, “They do now. We were before the swinging 60s.” Alan says, “I’m very good with babies. I never thought I’d live to be a great granddad.” He says he’d have to help with money to keep Raff in school. Celia says, I can’t see Caroline short either over this house business. Gillian reports that Ellie’s parents can’t be found. Judith arrives home with a sack of rattling bottles. She immediately pours a drink in a dirty cup from beside her computer. John is there with black trash bags full of his belongings. He says he’s going to get a flat near the university. He tells her about his publisher. She says he was just lucky for a while and that he’s never dared to do anything properly dangerous. She tells him to piss off. Caroline and Kate are walking beside a playing field outside the school. Lawrence and a friend watch from across the field. The friend says, “Do they snog (I think that’s the word he used). Lawrence says, “I don’t know.” He also says he might move in with his dad. Kate is talking about a baby. She has a donor in mind. A guy she went to university with named Greg. She says he’s nice, clever, good, like Caroline – one of the grown ups. Kate says it would be so easy because they could just “do it.” Caroline says, does he want children. Kate says it’s more about whether Kate and Caroline want children. Caroline, with very defensive body language, asks questions about Greg, his marriage and betrays that she might be a bit jealous. She says, “I need to meet him.” Kate says okay. Speaking of babies, Ellie’s pushing and Raff’s fainting and Alan’s coaching her along with the midwife (more excitement Alan doesn’t need). Ellie asks him to call her granddad. Guess who he is? Harry, Alan’s mate (Paul Copley). Gillian says, “You think you can just buy me?” He, of course, says no. He asks to see her on the weekend. She asks if they can have the conversation later. It’s a girl. 6 pounds 3 ounces. Ellie’s mother (Susan Cookson) finally shows up and says this is the first she’s heard of Ellie’s pregnancy. Harry’s arrived. The adults take turns blaming each other as they argue in the hallway. Raff and Ellie are in her room. Alan holds the baby as Celia says, Well, we got married and we got a baby. They kiss as the camera closes in on the baby.